There are many reasons for a pet to lose their vision. -cataracts -KCS or "dry eye syndrome"
Blind pets can often still live comfortably. The following are some steps you can take to help your pet make a mental map of his or her living space. Attach short directional words or phrases (such as Sit, Down, Stay, and Come) to your daily routine. Verbal cues reassure your pet and help him feel connected to your daily interactions. Your voice will both guide a reassure him. If your pet has limited vision, be sure to leave night lights or motion sensor lighting on so your pet can navigate better in the evening. Create landmarks for your pet- keep daily objects such as food bowls and pet beds in the same place. In addition, avoid relocating furniture, TVs, or radios to prevent any disorientation that may result when the pet's mental map is disrupted. Use different scents to map out locations or forbidden areas. For example, you can use scented oils or plug in air fresheners to cue your pet as to what room they are in- use one consistent scent for each room. When you travel with your pet, take these scents with you to provide comfort and guidance in an otherwise unknown environment. If your pet is distressed at not being able to find you, wear a familiar scent or clip a small bell to your wrist or belt loop. Return objects to where they belong. Things that are left out are opportunities for collisions that may disorient your pet and lead to anxiety. If your pet is disoriented, lead him to a favorite anchoring spot such as a familiar bed, and pet him calmly until he settles down. Using stairs can be difficult for blind pets. Install carpeting on the steps for traction and chaperone your pet until he feels confident- use a leash or guide your pet with your hands while using treats for encouragement. Example of a pet "Halo"
For dogs, one of the most important tools in dealing with blindness is the leash. Think of the leash as giving you the ability to hold your dog's hand. Your dog will feel more secure because he knows where you are. Leashing the dog can be helpful even in the house until he gets adjusted. Feeling socially isolated is a problem with blind dogs just as it is with deaf dogs. Most dogs seem reassured if they know where their owners are. A dog that has been free to roam the house may have to be confined at night. Securing your dog next to your bed at night or using a dog crate is an ideal solution. Several innovative companies now produce special halters for pets that include a plastic or wire loop that stretches out in front of them. These loops protect your dog from constantly bumping into things and hurting their face. Cataracts result from a disease process affecting the lens of the eye, causing the lens to lose its normal transparency and thus impairing vision; in some cases, cataracts can even cause blindness. The lens of the eye becomes thick and opaque, resulting in a whitish/ gray area in the center of the eye. Cataracts may progress slowly or rapidly, depending on their underlying cause. Cataracts can be a normal result of aging, but they can also be a result of a congenital defect, eye trauma, or secondary to some diseases such as diabetes. Cataracts are often confused with nuclear sclerosis- nuclear sclerosis is a normal aging change (seen in most pets over the age of 7 years) of the lens that gives it a faint white tinge and does not impair vision. In order to diagnose your dog’s eye condition, your veterinarian will perform a complete history, a physical examination, including an eye examination and certain tests to evaluate the eyes. Additionally, they may recommend bloodwork to look for underlying conditions that would have caused the eye disease. For complex cases, a referral to a veterinary ophthalmologist may be advised. If an underlying cause for the cataracts is found, then treatment of that disease is called for. Routine eye monitoring is recommended as some cases of cataracts can lead to secondary glaucoma (a painful condition involving buildup of pressure within the eye). Cataract surgery is possible for pets in an attempt to preserve their vision, but an ophthalmology specialist is needed as not all pets are good candidates. Eye Anatomy- only the edge of the third eyelid is typically visible. The third eyelid slides out horizontally to protect the eye when the animal blinks. 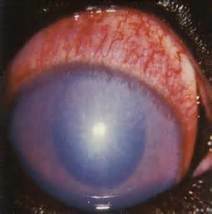 Prolapsed gland of the third eyelid- "cherry eye"
Pet with a "cherry eye"
The third eyelid is a pink structure just barely visible in the inner corner of each eye (toward the nose) in a dog or cat. This eyelid slides out horizontally when the animal blinks and helps to protect the eye. In addition, it houses the major tear gland for the eye. The tears produced from this gland help to keep the surface of the eye moist and prevents infection. Some third eyelid glands prolapse due to trauma to the eye; for example, rough play with another dog or an eye injury from a toy. There may also be a genetic link to a congenital weakness of the gland of the third eyelid. Certain breeds are more predisposed to this condition and it occurs most often in young dogs (usually less than 2 years of age). These breeds include: Cocker spaniels, Bulldogs, Beagles, Bloodhounds, Lhasa apsos, and Shih tzus (although any breed can be affected). 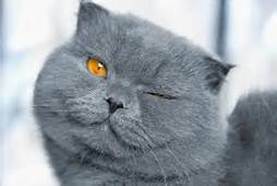 "Cherry eye" can occur in cats, but is rare. 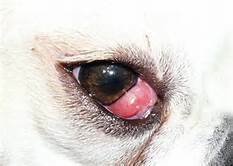 A "cherry eye" appears most often as a small, smooth, pink bump in the inner corner of the eye. It may appear in one eye or both eyes (it is not uncommon for one eye to be affected first followed months to years later by the other eye). If the condition has just occurred, some dogs may also show symptoms of squinting, pawing at the eye, eye discharge, or a red and irritated eye. 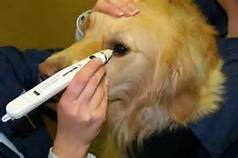 First, have your veterinarian examine the eye. Depending on the exam findings, eye tests to rule out corneal damage or medications to fight infection may be needed. In most cases, a "tacking" surgery is recommended in order to return the tear gland to its normal position. The long term consequence of leaving the gland prolapsed is the possible loss of a majority of tear production for the affected eye. (There are other tear glands for the eye, but the third eyelid tear gland produces up to 50% of the total tears). If tear production decreases, the eye may "dry out" causing pain, irritation, and infection that requires life long treatment. The tacking surgery is the best option because it returns the third eyelid gland to its normal position and helps to maintain tear production. However, complications of this procedure include recurrence (may happen in up to 25% of cases). Another surgical procedure involves removal of the prolapsed gland. This method returns the eye to a normal appearance, but patients run the same risk of "dry eye" because the tear gland is gone. This procedure is usually recommended only for those patients who have tried the tacking procedure and the prolapse has recurred. Eye Anatomy. Corneal ulcers are abrasions on the surface of the eye. 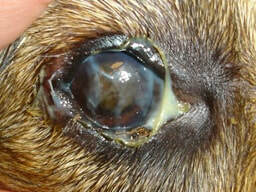 Corneal ulcers are painful and affected pets will often squint or keep the affected eye shut. Fluorescein stain is used to detect a corneal ulcer. The cornea -- the transparent outer part of the eye --forms a cover over the iris and pupil. It also admits light to the inside of the eye. A corneal ulcer occurs when deeper layers of the cornea are lost; these ulcers are classified as superficial or deep. The following breeds, all characterized by short noses and prominent eyes, are more likely to develop this problem. Your veterinarian will conduct a thorough eye examination, including an inspection of the eye and cornea. Diagnostic fluorescein dyes are often used to look for corneal erosions or ulcers. Treatment will depend on the underlying cause. Generally, antibiotic topical medications are used to treat or prevent eye infections. Pain medications may be needed for comfort. Buster collars ("cone") are often needed to prevent further eye damage caused by rubbing. If the ulcers are deep or are growing, surgery may be required. A common surgery is called a grid keratectomy during which the veterinarian may take a cotton swab and remove loose layers of the cornea to allow it to heal better. KCS eyes appear dull and dry and these pets suffer from recurrent eye infections and corneal ulcers. Thick discharge that sticks to the hair around the eye is common. A Schirmer Tear Test is a non invasive method for diagnosing "dry eye"
KCS or "Dry eye" is a common eye disorder that involves a deficiency in normal tear production. 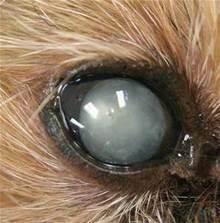 This deficiency may occur in one or both eyes and is most often a problem in small breed dogs such as Lhasa apso, Shih Tzu, and Pugs. Pets with "dry eye" often have thick, mucoid, ropey eye discharge. In addition, conjunctivitis can give the eye a red, swollen appearance. In severe cases, the cornea (the clear outer surface of the eye) may develop tiny blood vessels or pigment across its surface which interfere with vision. Painful corneal ulcers may appear either secondary to trauma due to the pet rubbing at the irritated eye or a secondary eye infection. There are many possible causes of "dry eye". In a majority of cases there may not be a definitive cause and these cases are called idiopathic. Idiopathic "dry eye" is suspected to originate from a disorder of the immune system, but this has not been confirmed. Systemic lupus, diabetes, thyroid disorders, adrenal gland disorders, and some medications are other potential causes of "dry eye". Your veterinarian may recommend a Schirmer Tear Test (STT). This test is a quick, painless method of measuring tear production. A special calibrated test strip is placed in each eye and held in place for one minute. The amount of tear production is then read off the strip. A normal dog will have a result of 12 to 24 mm per minute. An in depth ocular exam and fluorescein dye test for corneal ulcers may also be recommended depending on physical exam findings. Tear production stimulators suppress the ocular immune system to encourage increased natural tear production. Tear replacement ointments are used in the early stages of therapy to provide comfort and keep the cornea healthy. Topical corticosteroids are helpful to ease inflammation but are not appropriate in all cases. Topical antibiotics may be necessary if irritation has led to a secondary bacterial infection. Eye with Glaucoma- notice the extreme redness and irritation coupled with the hazy-blue tinted cornea. A tonopen is a non invasive tool for detecting glaucoma. A normal eye contains fluid called aqueous humor that helps to keep the eye inflated and provide nutrients to the eye's internal structures. When too much of this fluid builds up, the pressure within the eye increases and this is called glaucoma. This increased pressure may be caused by hereditary factors, inflammation of the structures within the eye, disorders of the lens, or tumors. Glaucoma is a serious disorder, which can occur in one eye or both, and may arise quickly or build up slowly over time. Glaucoma is a painful disease and is the leading cause of blindness in middle aged dogs. Glaucoma has a variety of presentations depending on the severity and how quickly it comes on. Early in the disorder, the eye may appear red, watery, or irritated. As the pressure increases, the affected eye may appear larger than normal and have a bluish or whitish tinge to the eye surface. At this stage, the eye may become very painful. Your pet may be rubbing at the affected eye and may be sensitive to light (winking, squinting, avoidance of sunlight, etc). If left untreated, glaucoma will eventually lead to permanent blindness and rupture of the eyeball itself. The intraocular pressure of the eye can be measured in a fast, non invasive test. 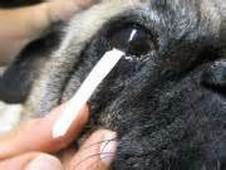 The test is performed by applying a topical anesthetic drop to the eye. Then, an instrument called a tonopen is quickly tapped on the eye surface to read the internal pressure. Several readings are performed per eye and averaged together. Your pet will not be able to feel the instrument and the test only takes a few minutes. All senior dogs (over the age of 7 years) can benefit from an annual glaucoma screening or a test may be recommended on a case-by-case basis if your pet has an eye problem. Cats may be affected by glaucoma, but it is not as common. Glaucoma is a very serious disorder and treatment should begin immediately to provide comfort and to retain vision. Medical treatment consists of various eye drops or possibly IV medications depending on severity. These medications either decrease the amount of liquid being produced within the eye or they encourage the natural drainage from the eye. Multiple medications may be needed. If medical therapy is not adequate or if the pet is already blind, then surgical treatment which involves removal of the eye may be discussed. Eye removal may seem extreme, but if the eye is no longer visual, surgical removal may be the only method of taking away the pain. Certain breeds are more predisposed to glaucoma: Akita, Alaskan Malamute, Basset hound, Beagle, Border collie, Boston terrier, Carin terrier, Corgi, Chihuhua, Chow, Cocker spaniel, Dachshund, Dalmation, Springer spaniel, Great Dane, Maltese, Min Pin, Poodle, Scottish terrier, Shih Tzu, Siberian husky, and West Highland white terrier. Among cats, hereditary glaucoma is rare but: Persians, Siamese, and some Domestic Short haired cats may be predisposed. Entropion surgery involves removal of a layer of skin below the eye that once sutured, unrolls the affected eyelid. This is an example of surgical repair for ectropion. This pet is affected by ectropion. Entropion occurs when an eyelid is inverted (curled inward) causing the eyelashes rub against and irritate the eye. Entropion can affect upper or lower eyelids or both and be present in one or both eyes. Technically, entropion can be seen in cats, but it is much more common in dogs. Any dog breed can be affected, but this condition is commonly seen in Chow Chows, Shar-Peis, Mastiffs, Rottweilers, Great Danes, and St. Bernards. Entropion is usually regarded as a congenital eyelid defect. 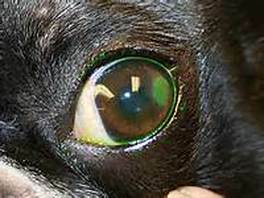 However, some dogs can develop entropion after eyelid injury. Symptoms include: squinting, chronic watery eyes, pawing at the eyes, and development of recurrent eye infections or corneal ulcers. Inflammation caused by the eyelashes rubbing against the eye surface can cause pigmentation of the normally clear cornea; thereby, affecting vision. Treatment for entropion involves delicate surgical removal of skin which allows the curled eyelid to roll back to its normal position. In some cases, repeat surgeries are performed if not enough skin could be removed with the initial procedure. If too much skin is removed, ectropion can result. Ectropion occurs when the lower eyelid droops downward or rolls outward, leaving a large gap between the eyeball and the facial tissue. One or both eyes can be affected. There are many breeds in which ectropion is common: St. Bernards, Great Danes, Bloodhounds, Mastiffs, and Newfoundlands to name a few. For most dogs, ectropion is an inherited condition, but this condition can also develop secondary to an injury or infection. Symptoms include: droopy lower eyelids, increased tear staining, redness or inflammation of the under eyelid tissues (conjunctivitis), and increased risk of eye infection. Ectropion may not require treatment depending on the severity. Mild cases may benefit from lubricating eye drops to ease inflammation. Severe cases may need surgery to remove excess lid. Uveitis ("you-vee-I-tis") is inflammation of the "uvea" inside the eyeball. The uvea consists of the structures that help make up the iris, ciliary body, and choroid. - The iris is the colored portion of the eye that contracts or dilates in response to light. - The ciliary body is the part that produces the fluid contained within the eyeball. - The choroid provides nutrition to the retina. There are many potential causes for uveitis: viral infections, bacterial infections, parasites, fungal infections, tick related disease, immune system disorders, cancer, or eye trauma are a few examples. Bloodwork may be recommended to help rule out underlying causes if your pet is ill. Uveitis is best treated by resolving the underlying problem; however, in up to 75% of the cases the exact cause of uveitis is never determined. Symptoms of uveitis may include: squinting, watery eye discharge, sensitivity to light, small constricted pupils, cloudiness or a bluish tint on the surface of the eye, or red irritation to the whites of the eye (sclera). Uveitis may occur in one eye or both eyes. Uveitis is diagnosed by an examination of the eye and a measurement of ocular pressure. Ocular pressure is maintained by fluid which is continually produced inside the eyeball by the ciliary body. There is also a "drain" inside the eye, so that fluid does not buildup. If the ciliary body is inflamed, fluid production slows down and the ocular pressure drops. If uveitis is left untreated, then glaucoma may develop resulting in permanent blindness. Glaucoma is an increase in pressure that may occur following a bout of uveitis if the inflamed iris blocks the drain for the fluid. Aggressive medical treatment of uveitis is needed to prevent secondary glaucoma and possible blindness. Often topical drops or oral steroids are given to control inflammation. Topical atropine ointment may also be recommended to relax the iris muscle and give pain relief. Antibiotics may be prescribed if underlying infection is suspected. Periodic rechecks are needed to asses treatment success. Long term prognosis is generally good is treated diligently. Keep in mind that certain patients, life long treatment may be necessary.